Many of us, particularly sports people, have experienced a ‘tendonitis’ injury during their running careers. The ‘itis’ at the end of a diagnosis means that the structure is inflamed. The immediate treatment would be rest and ice and work on the cause of the injury should be addressed. This can be strength, imbalance, technique or external issues like footwear. The term ‘tendinosis‘ is used when there is a pathology involving the internal structure of a tendon. It is most commonly seen those over 35 years old where there is degeneration of the e.g. the Achilles Tendon. They usually will experience stiffness after rest, being worse in the morning and making the stairs difficult to descend. Once the tendon is warmed up it becomes less uncomfortable and walking or sport becomes more comfortable. However, it then really stiffens up later on. It is important to get an expert diagnosis of the tendon. The Physiotherapist or Consultant will take note of the history which gives important clues as to the nature of the issue – ‘itis’ or ‘osis’, or both! Examination looks for signs such as a localised area of tendon stiffness and a fusiform swelling. Treatment usually involves specific soft tissue mobilisation techniques, some of which can be taught to the patient for self-treatment. We also use Shockwave therapy to stimulate the healing process. This has been a huge assistance to us in the past few years and the evidence base is growing alongside our experience in how it works best for you. We do not charge extra for this treatment, unlike many other clinics. It is also vital to assess the athlete’s biomechanics to identify the part of the techniques that are applying abnormal stresses to the tendon and damaging it. 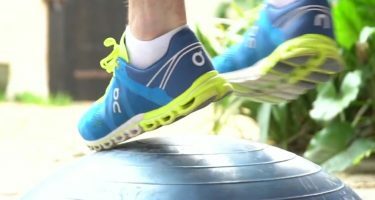 This involves not only their running technique, but also their alignment and control on the affected leg. Mal-alignment, weakness or ‘collapsing’ slightly on that side would be contributing to this problem. In a racquet sportsperson, this will involve looking at the ball hitting technique. 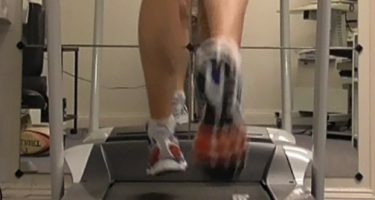 In addition to exercises specific to that patient’s unique biomechanics, it is also important to strengthen the tendon involved. Your Physiotherapist will prescribe appropriate loading exercises designed to target the tendon. The sets and reps will be carefully set for you and your tendon and progressed over time with weight and more dynamic work. Tendons are slow to heal due to their poor blood flow. Working on all the fronts described above is the evidence-based approach to conservative treatment. In years gone past many tendons ended up with surgery to mixed outcomes. These days tendons surgery is rare because Physiotherapists have become excellent at treating them. Occasionally we will seek some images, like an MRI, to confirm aspects of the diagnosis and help us direct treatment better. Sometimes injection therapy helps to settle the acute pain. However, an injection only treats the symptom. It does not address the strength of the tendon, which has to be restored, and it does not address the causative factors, such as biomechanics. If you have had an injection for a tendon issue and the problem has recurred it is because you have not treated the cause yet.